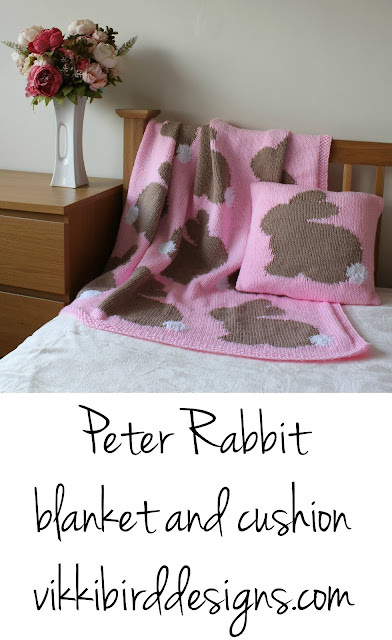 I'm launching two new patterns today: the Peter Rabbit blanket and cushion. These patterns are perfect for spring and they're both knitted in chunky weight yarn, so you should be able to knit them up in time to give as gifts for any new babies that arrive before the summer. And you can alter the background colour so that the set fits in whatever the colour scheme of your nursery. The Peter Rabbit blanket features nine bunny rabbits arranged across a square in three rows. The first and last rows face left, while the central row faces right. The blanket is worked from the bottom up with the bunnies added using the intarsia technique. A moss stitch border is worked at the same time as the main body of the blanket, thus minimal finishing is required. The Peter Rabbit cushion is a much smaller project, featuring a single bunny at its centre. The pillow is fastened with four buttons across the back and is designed to fit a 41 cm [16 in] square pillow with a little negative ease to ensure a nice plump pillow. The pillow cover is worked flat in one piece, starting in the middle of the back with a 2 x 2 rib buttonband, then the first half of the back, the front and the second half of the back are worked in stockinette stitch, and finally the 2 x 2 rib buttonhole band is worked. The pillow cover is seamed down the side edges using mattress stitch. The large blocks of colour make these items a good project for someone who is new to colourwork. Instructions for the intarsia section(s) are provided as both charts and written instructions. The samples are knitted in Hayfield Baby Chunky,* a super-soft acrylic/nylon blend, and the tails are knitted using Sirdar Snuggly Snowflake,* a textured polyester yarn, which adds a little extra texture. Both yarns are easy care, making them perfect for babies and new parents alike. From now until 11.59pm GMT Thursday 22nd March you can use the code SPRING when buying either of the patterns to get 25% off. **Remember that only one offer can be applied to a basket.